A DIYer miraculously survived after accidentally firing an three inch-long nail into his skull - without even noticing. Yang Yi Kui, 55, from Jiangsu province, China, is recovering in hospital in Nanjing after surgeons removed the steel pin which was lodged near his left eye socket. 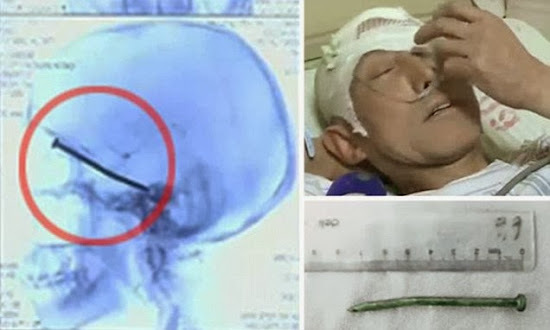 Incredibly, he did not even realise the nail had ripped through his skull until he went to the hospital feeling sick and it was discovered by doctors. Mr Yang had been using a cutting machine while decorating his home on December 29 when the accident happened. The nail, which had got lodged in the machine, was fired out at the speed of a bullet, ripping through his head but leaving just a tiny hole in the skin which he mistook for a minor injury. 'The nail that got stuck in the cutting machine flew out when I turned on the machine. It ripped into my head and left a small hole on the skin,' he was quoted as saying by Sky News. After spotting the nail on CT scans, medics had to carry out delicate surgery on Mr Yang to remove the nail without causing any further damage to his brain and eye. Remarkably, his vision was not affected by the injury. Luo Liangsheng, a neurosurgeon, said: 'The nail penetrated his eye socket and reached the petrosal bone after passing through the middle cranial fossa. Mr Yang is in currently in a stable condition in hospital.